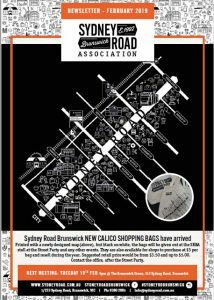 Each month the Sydney Road Brunswick Association produces a newsletter, informing traders and locals of events in the area. This includes relaying relevant council events, community news – such as road works and local events- as well as discussing what we are doing here at the SRBA and welcoming new shops to the area. If you have any news for us, as a local or as a trader, that you would like to see in our monthly newsletter, don’t hesitate to get in contact with us.